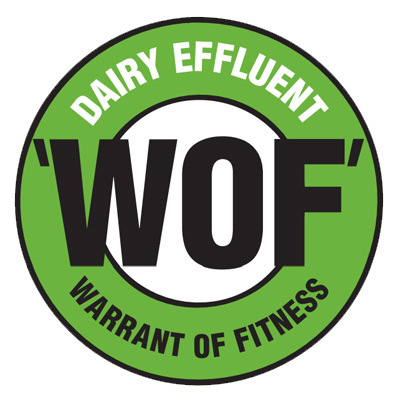 The Dairy Effluent ‘Warrant of Fitness’ (WOF) is a voluntary programme assessing your effluent system. It helps you understand all the requirements to make sure your system is fit for purpose and capable of being compliant 365 days a year. You will receive a brief report with practical actions you can take. The assessment is carried out by a trained and certified independent professional and takes three to four hours. Getting a dairy effluent warrant of fitness is voluntary and confidential, the video below shows what's involved and the benefits of getting an effluent WOF. What is the Dairy Effluent 'WOF'? This looks at your farm’s effluent consent or permitted rules: are all requirements being met? This depends on the size of your farm. It will probably be in the range of $800 to $1,300. The certified ‘WOF’ assessor will give you an estimate before coming to your farm. Why should I choose a certified assessor? A certified assessor is an independent, experienced industry professional. To become certified, the assessor has completed a three-day training course and passed a competency assessment process. The assessor is committed to observing a Code of Conduct to guarantee professional behaviour and independent advice. Do councils recognise the 'WOF'? At this stage the ‘WOF’ is a voluntary programme that helps you identify and address risks. For more information, download the WOF brochure. More detailed information can be found on www.effluentwof.co.nz with contact details of Certified WOF assessors in your region. Download the Dairy Effluent Warrant of Fitness brochure here.